Why is this the best BBQ set out there? All 4 of these tools are built to withstand an atomic bomb. These are built for the griller who is master of their domain and compromises nothing when it comes to his or her grilling masterpiece. Spend less time with cheap BBQ sets and more time with your friends and family. The spatula and fork are 18 inches long. The tongs are 16.5 inches long. The basting brush is over 16 inches long. 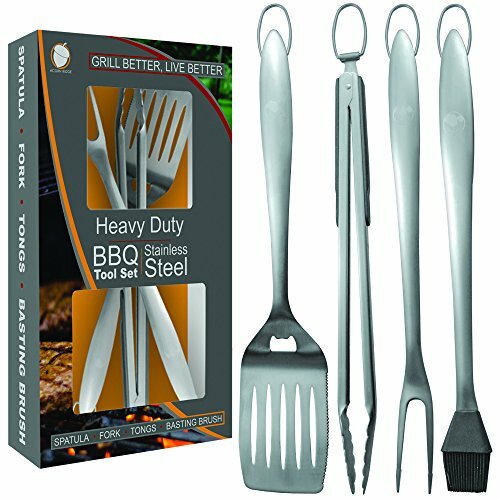 All 4 tools are longer and thicker than most other self-proclaimed "Heavy Duty " BBQ Tools. Why should I buy this instead of an 8, 16, or 20 piece BBQ set? Most of the BBQ sets you'll find packed in a case have small and flimsy tools, plus you'll never use half of them. They look good, but aren't made to last. Don't settle for less. There's a reason you get 20 BBQ tools for the same price as our BBQ kit. BBQ sets with wood handles splinter over time. Stainless steel doesn't. Built for the griller who is large and in charge of the grill. With smooth, contoured handles and large hanging hooks, this will be the only BBQ set you'll ever need. You'll be the envy of all your friends with these 4 beefy tools. While others are struggling with flimsy tongs and a limp spatula, you'll be rockin' and rollin' all afternoon long. We put family and friends first. You're not just a customer, but a part of our grilling family. UNLIKE OTHER BBQ SETS with rock-bottom prices, our grill tools are made of premium stainless steel and will last forever. You could save a couple bucks buying a cheaper set, but it'll only last a year or two before it starts to fall apart or rust. We put quality over price and refuse to sell subpar grilling products. Just look at all our 5 star reviews. ‍‍‍BRING TOGETHER FAMILY & FRIENDS: We help families just like yours enjoy tasty grilled meals every day. Some of the best moments in life are made around the grill with friends and family. That is why we are dedicated to providing quality grilling products that will last a lifetime. This 4-piece set will last the test of the time and be right there with you as you make lasting memories around the grill and enjoy home cooked meals. WE ARE REAL PEOPLE WHO USE OUR PRODUCTS EVERY DAY: We expect the best when we grill and want the same for you. We don't want you to have 20 BBQ tools you'll never use, we want you to have 4 BBQ tools you'll use every time you fire the grill up. Made with integrity and built for those who have a passion for grilling with friends & family. FREE DELICIOUS RECIPE EBOOK: When you're ready to put those huge BBQ tools to use, we've got you covered with the best Beef, Pork, and Chicken recipes. Your mouth will be watering while you wait for your BBQ kit to arrive. THE PERFECT GIFT:Give your griller all the tools they need to dominate the grill with no extra fluff. These 4 tools are for those who are passionate about grilling and love making grilled or smoked food for friends and family. Completely stainless steel and will not rust. Dishwasher safe. View More In Grilling & Barbecue Utensils. If you have any questions about this product by Acorn Ridge, contact us by completing and submitting the form below. If you are looking for a specif part number, please include it with your message.